Leftist Media Strike Force - Klayman: CNN's Acosta Should Have His White House Press Credentials Revoked and CNN Should Send Someone Respectful to Cover the Presidency! Go to www.FreedomWatchUSA.org to Join FW Leftist Media Strike Force! Klayman: CNN's Acosta Should Have His White House Press Credentials Revoked and CNN Should Send Someone Respectful to Cover the Presidency! Go to www.FreedomWatchUSA.org to Join FW Leftist Media Strike Force! 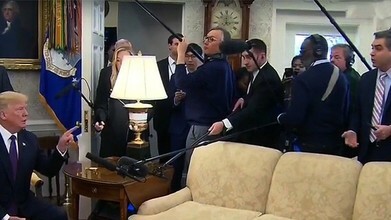 President Trump kicked CNN star Jim Acosta out of the Oval Office Tuesday after the network's senior White House correspondent badgered him with racially charged questions. Acosta has made a habit of grandstanding and interrupting when Trump and his surrogates are available to the media. Tuesday was no exception, as Acosta yelled, "Mr. President," three times before finally getting Trump's attention.